On March 25, at the JA Okinawa Nishihara Branch, Director Jun Nishihara of Nishihara Farm and processed goods store sales staff promoted nigana. As its name suggests, nigana is a leafy vegetable with a strong bitter taste. However, unlike bitter melon, nigana is not well known, and there are few applications for its processed products. Nigana is very rich in nutrition, containing much Vitamin A for maintaining healthy skin and tissue, Vitamin C for enhancing immunity and collagen formulation, as well as calcium and iron. Arakawa explains, “People have hesitated to use it because of its name and taste, but it really is very nutritious and can be cultivated throughout the year without using agrichemicals. 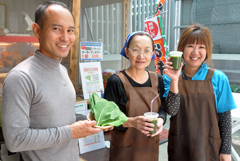 As a starter from February, at the processed goods store next to the JA Okinawa Nishihara Branch, nigana juice will sell for 100 yen a cup. When it is mixed with 100% pineapple juice, locally produced nigana juice is much easier to drink. For more information, call Nishihara Farm at 098-945-4540.